Who doesn't love pasta? Its the favourite one pot meal in house too! This is a very easy recipe, and requires only a little bit of your time and effort. 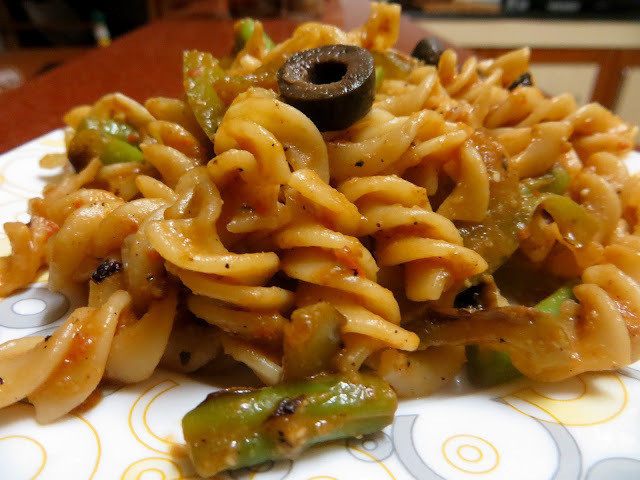 The kids love it too, and I usually make it a healthy dish by using whole wheat pasta (you can use regular pasta as well). A regular dish for the school lunch box as well! Boil water 8 cups water in a large pan, add salt to it. When the water starts boiling, add the pasta to it and let it cook till done (roughly around 10 minutes, depends on the brand of pasta you use). Drain and set aside. Put the tomatoes in boiling water for 5-6 minutes. Remove the skin and blend into a smooth paste. In a wok, heat a tsp of olive oil and add the tomato puree, basil leaves, chilly flakes, salt and sugar in it and cook till it reduces to a saucy consistency. In another wok, heat olive oil and fry the finely chopped garlic in it. Now add finely chopped onions and sauté for a while. Add thinly sliced bell peppers and sauté for a couple of minutes. Now add the cooked fusilli pasta and the sauce on top and mix well. Add the oregano flakes and serve hot. Top with olives and chilly flakes. This entry was posted in 30 minutes recipes, Lunch box ideas, Vegan . Bookmark the permalink.